“The BC government is subsidizing fossil fuel development in the form of tax relief for major international corporations to the tune of $5 billion dollars—or five times the amount budgeted for investment in the province’s CleanBC climate plan. 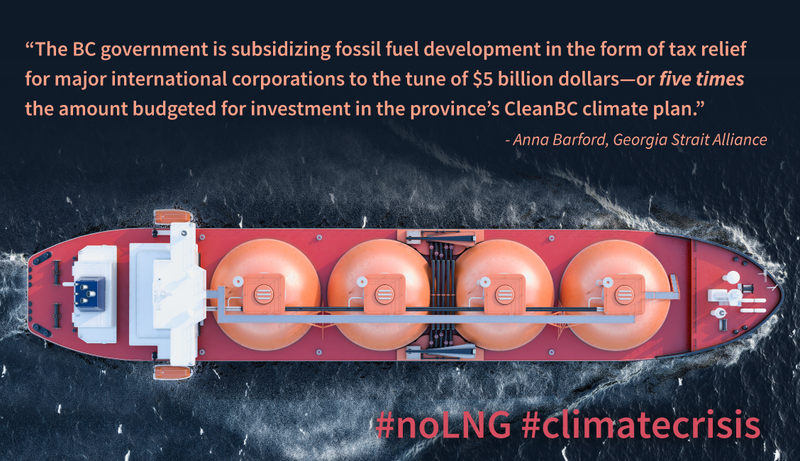 It’s clear that without this subsidy from BC taxpayers that LNG Canada’s proposed $40-billion project in northern British Columbia, and other projects, would not be viable. Generous estimates for jobs related to LNG Canada’s project are 10,000 for the construction industry over a five-year period, with fewer than 1,000 permanent jobs. Meanwhile, the global marketplace for clean tech industry is estimated to build to three trillion dollars by 2020 and our green building industry employs 32,000 British Columbians. Why does the BC government continue to invest in new fossil fuel infrastructure when we’re in a global climate emergency? The IPCC’s report outlines that we need to reduce our dependence on fossil fuels in a big way within 12 years or we will blow past our target of limiting global temperature increase to 1.5 degrees. Instead, let’s invest in clean energy sectors that strengthen our economy and support communities in actively reducing their greenhouse gas emissions, while also helping us to meet our long-term targets.